We offer a variety of classes, fun girl's nights, birthday parties or just alone time to come and sew! Come join the fun! Here's a reinvention of the traditional baby shower. Invite guests to our studio, bring decorations, punch and snacks, and then let's make some fun and unique baby items for the mom-to-be! Each attendee can make the same thing for the new baby like an appliqued onesie or burp cloth. Or instead of every person making the same thing, we will work in pairs to do multiple sewing items & crafts for the new little one. We promise there will be something for every skill level (sewers and non-sewers). Ideas include banners/pennants, appliques for onesies, headbands/bowties, diaper caddies, burp clothes, bibs and blankets! Prices vary upon projects chosen. Get the girls together and let's do some sewing or Pinterest crafting! You pick the project, and we will help you sew it. Leave with a one-of-a-kind item that you made yourself. Come by and see us and pick from all kinds of projects or let us know what you are wanting to do and we can find one for you. Want to do a craft project from your fave Pinterest board? Bring the wine (or stop at the Frosty Factory next door) and let's do some crafting! Prices vary depending on project type. Call for details. Kids are always wanting to do something fun and new for their parties. At Niche Fabric & Studio, we can help you throw a party that they will never forget. Just bring the cake and we can help with the fun! You can choose from a Sewing Party (Hand or Machine Sewing) or Crafting Party. Parties are usually 1.5 hours long, with 45-60 minutes of crafting and sewing, and the remainder of the time used for cake and presents. Looking for something fun to do with your bridesmaids and need a gift for them? How about making it together! We will help you and your bridesmaids sew a clutch to use at the wedding, a cute bag for their make-up and jewelry, or an adorable mani-pedi back to pamper themselves with. Everyone works on the same project, but we can personalize them to fit everyone's personality. Prices vary upon project chosen. Call for details. Our studio is set up with sewing machines, tools, and tables for you to use anytime we are open and not having a class. Sewing in our studio is a great way to get a change of scenery from your home or sewing room or if you don't have a sewing machine yet or all the tools. Plus there is an instructor there who can help. A basic knowledge of sewing is required. An instructor is available if you have a question or an issues arises with your machine or project. No prior sewing knowledge is needed. We can work one-on-one with you to teach basic sewing skills or help walk you through a specific project. This option is also available for young people, 6 years and up. Call to book your spot 337.477-3810. 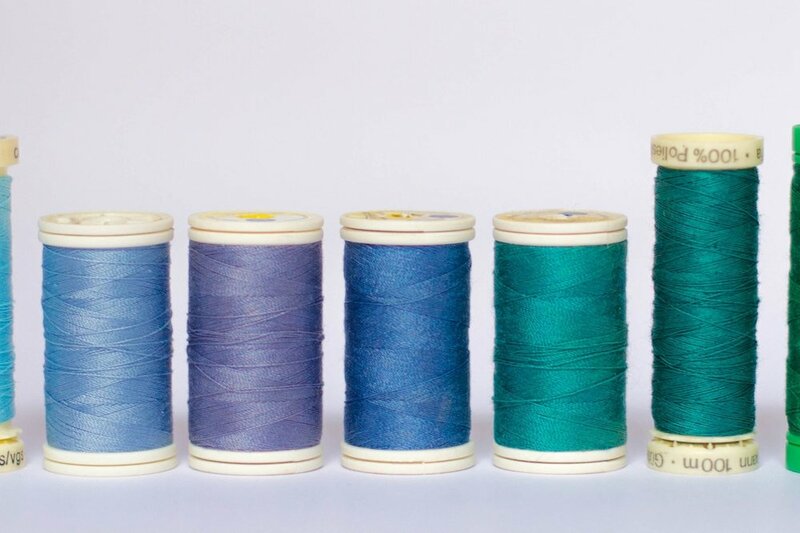 After School Sewing sessions are a great opportunity for your child to receive a small group, personalized instruction in areas of sewing and crochet that they are interested in. Various session will be available throughout the Fall & Spring Sessions. If you have a child who is home-schooled and would like to come during the day, please contact Melissa Hill at the studio at 477-3810 or contact us HERE. This series is for those who are new to crochet or have a basic knowledge. Participants will learn to work with their crochet hooks on several stitches, read a basic crochet pattern, and will choose projects that interest them. Cost is $135 for 9 total hours of instruction over a 6 week period. You are welcome to pay up front (sign up online) or weekly (contact us to reserve your spot). Make up sessions will not be available so please check the dates before signing up. A supply list will be given each week. Open to ages 9 and up. Parent/child combos are welcome. This series will cover all of the basics of sewing including how to use a sewing machine, important tools and notions, basic stitches, and finishing, all while working on fun and simple sewing projects. We will also introduce helpful hand sewing techniques. Projects will include things like pillowcases, drawstring bags and more. Cost is $135 for 9 total hours of instruction over a 6 week period. You are welcome to pay up front (sign up online) or weekly (contact us to reserve your spot). A supply list will be given each week. Open to ages 7 and up. Parent/child combos are welcome. This series will build on the basics of using a sewing machine. This class is for those who have taken after school sewing already or have a good base knowledge in sewing already. We will cover things like zipper installation, button holes, and ruffles as well as advanced hand sewing techniques. Projects will include zipper bags, aprons, and more. Cost is $135 for 9 hours of instruction over a 6 week period. You are welcome to pay up front (sign up online) or weekly (contact us to reserve your spot). A supply list will be given each each. Open to ages 7 and up. Parent/child combos are welcome.